Real estate is something every Indian understands well and like Gold, that Attachment for AT LEAST EK GHAR is at the zenith of every Indian's heart. And REITs seems to be a good alternative for those who cannot afford to invest big time in Real Estate. Buying a REIT is the most transparent way to own Real Estate for a Lay Man. WHAT IS THIS REIT ? Real Estate Investment Trust, known more popularly in its short name, REIT is similar to Mutual funds. A REIT collects money from Investors and invests in Real Estate Properties (commercial and residential) with the intention to generate FIXED INCOME through Rents. Since the earning is from RENT, which can be monthly, quarterly, Half Yearly or even Yearly, REITS pay, typically, dividends on a Half-Yearly basis. Indian Laws specifically say that REITS can invest only in those properties that are at least 80% completed. SEBI came out with list of DOs and DONTs for REITs way back in 2014 and in US, REITs are in vogue for quite a long time and more than 300 are registered and about 40,000 commerical Properties in the US are owned by REITs !! SEBI, to begin with, has mandated the MINIMUM investment to Rs.2 lakhs and just recently further reduced it to Rs.50,000. Exactly similar to a Mutual Fund, REIT too will have a Sponsor which establishes a Trust. 1. 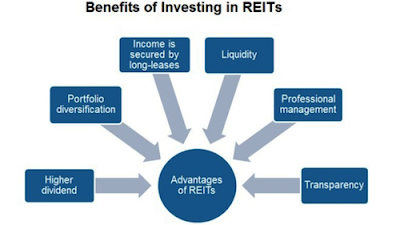 A REIT (like a Mutual fund) collects money from Investors. 2. These monies are invested across Rent Generating Properties. 4. The REIT distributes the Rent to Investors via periodical Dividend. Land: In India, REITs cannot invest in land. But in mature markets, REITs can own raw land and develop it or sell it when they think there is appreciation on the price. Also, there are REITs which invest in land of farming. 3. Long term tax (sold AFTER 3 years) will be at 10% of Gains. The Dividend will be ADDED to the overall income of the Investor and will taxed accordingly. Owning a Real Estate is a challange both financially and legal hassles, REITS is an easy simplified asset class to own the same without actually owning it Physically. 4. Since SEBI has mandated that 90% of the Distributable Cash flows must be distributed with the Unit Holders, there is a good scope for regular income. A good alternative to Fixed Deposits and Bonds as the returns in REITS are more or less assured due to regular rents. Since REITS will be investing in Different Geographicals and mostly in Rental generating assets, it offers Investors a Good Diversification Option. REITs are mandated to distribute 90% of profits in form of dividends which is distributed quarterly making REIT a convenient way to have a Steady stream of Interest Income. 1. Huge entry at Rs.2 lakhs. This could impact small investors. Yes..SEBI has indicated that it will be soon reducing the same to Rs.50,000 but for now its out of bounds for huge number of small investors. Please note : Once it is listed, trading will be for a minimum lot of Rs 1 lakh. 3. The Average Rental Yield is not very attractive in India at present (at about 5% to 8%). 4. The biggest point you should note is that REITs could be very very volatile. They are not steady and flat. NO Sir ! And Short term performance could be awful. In fact, in the US, Dow Jones REIT Index fell 17% in 2007 and 39% next year! If you your Asset Allocation is skewed towards Equities and needs more of Debt, REIT could make a great alternative asset class. Going forward, more tighter regulations and more players will only be making REITS a much more attractive asset. Another point to be noted is....Motilal Oswal in its note has says that Embassy Reit is priced at 20% DISCOUNT to its NAV and offers a yeild of 8.25% per annum. And Chairman of CBRE, Anshuman says "We estimate 12% to 14% overall returns over a 5-7 year period"
Some analysts have gone as far to predit a return of 12% to 14% POST TAX !!! US Reits have given returns around 6% to 8% and shockingly Infrastructure Investment Trusts (similar to REITs) are actually trading BELOW their Offer Price. So....capital appreciation should not be the criteria to invest. 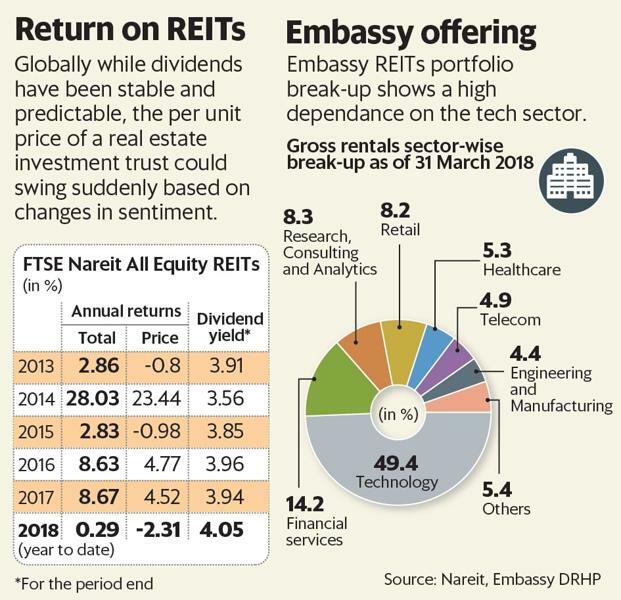 So, overall, if you are sure that you are in for LONG TERM, wont mind volatility, want steady cash flows, you can GO AHEAD WITH INVESTING IN EMBASSY REITS. Bangalore based Real Estate Gaint EMBASSY GROUP under its group company EMBASSY OFFICE PARKS, is coming up with India's FIRST ever REIT (Real Estate Investment Trust) aiming to raise around Rs.4750 crores. The issue has a price band of Rs 299-300 per unit and will close on March 20. The total issue size is 12,95,56,000 units. Embassy Office Parks is a Joint Venture between the Embassy Group and US Private Equity Gaint BLACKSTONE. The Embassy Office Parks has about 33 Million Square Feet of Office and Hospitality assets under this REIT spread across 7 properties and 4 cities Mumbai, Bangalore, Pune and Noida. Minimum Bid is 800 units. Hence multiples in 1.6 lakhs. 2. Out of this 24 million, more than 95% is already operational and yielding a Rental Income of over Rs.2,000 crore annually. 3. Besides, the Embassy REIT will be adding another 42 Million sq foot of property very shortly. 4. Embassy has its properties in the right places namely Bangalore, Noida, Mumbai and Pune. All highly attractive cities for MNCs. And especially Bangalore and Noida are growing at DOUBLE DIGIT since 2013. 5. Embassy REIT also has a ROFO (Right of First Offer) for 2 Under construction properties in Chennai and Hyderabad. 1. Nearly 49% of Embassy REITs rental incomes from Technology companies which raises a huge concentration risk. 2. Embassy REITs is heavily skewed towards MNCs. This could cut both ways and especially very badly during Meltdown as MNCs are known to be ruthless when it comes to cost cutting. Fidelity, Citigroup, Morgan Stanley, Capital Group, TT International, Schroders, Kotak Mahindra Life Insurance, Damanis already investing huge sums of money. This shows the apptetite for REITs and an unexplored virgin asset class. The Net Distributable Cash Flow for Embassy REIT is at a appreciable rate of 8.2% for period between FY 16 and FY 18. This definitely looks attractive and one can consider going ahead with investing in the EMBASSY REIT. The returns (albeit in single digits) is more or less assured due to RENTAL income and thus can be considred for DEBT portion of your portfolio. Do take your Financial Advisor's advise before taking any decision.